8.6" x 6.5" stitched on 14 count. 6.7" x 5.1" stitched on 18 count. 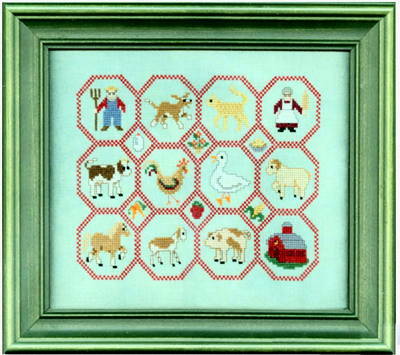 Down on the Farm cross stitch pattern... The farmer, his wife, dog, cat, various farm animals and a barn are each represented in the 12 eight-sided spaces. The small blocks each show a farm related image.